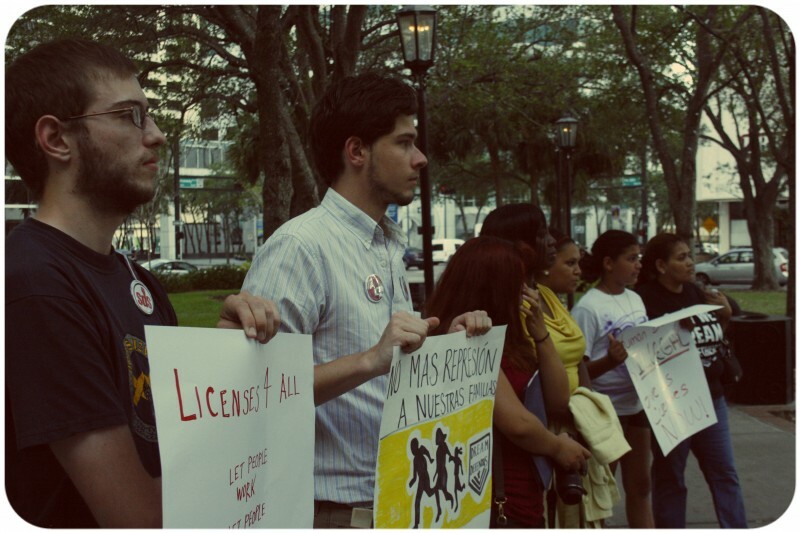 Immigrant rights activists demand licenses for all in Florida | Fight Back! 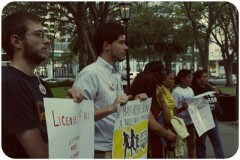 Tampa, FL – On April 18, immigrant rights activists, community members and students demanded that the city of Tampa allow drivers licenses for undocumented people. In the morning, activists with Dream Defenders marched into city hall demanding that the city council pass a resolution in favor of the state of Florida passing a law granting licenses for the undocumented. The Tampa City Council attempted to shut down speakers for demanding licenses for all. After the council meeting, the activists left with council members inviting them to meet again on a personal basis. Later that night, people from around the Tampa Bay area gathered in a downtown park to demand licenses for all undocumented people. A crowd of people came together in a huge circle and listened to speakers. Dream Defenders, along with United We Dream, the ACLU, Students for a Democratic Society, Mexican American Student Association at the University of South Florida, Members Empowering True Awareness and Hondurenos Unidos En Tampa spoke at the rally. They all cited examples as to why it is important that all undocumented people in Florida have drivers licenses. Currently, there are an estimated 1.5 million undocumented people in the state of Florida. Without papers and legal status, these undocumented people do not have the same rights as others. They live a life of fear of deportation, incarceration and separation from their families. On top of that, the undocumented are exploited by employers and others who take advantage of their status and make them work for extremely low wages and in horrible conditions. Within the past ten years, several cases of modern-day slavery have been discovered, where the enslaved have been undocumented people from Mexico and Central America. If Florida granted licenses for all undocumented, many of these abuses would not happen. Currently, most of the deportation and incarceration cases happen because of traffic violations like driving without a license. With a license, undocumented people could drive to work, school and other places without the threat of getting thrown into jail or even deported. People left that night ready to return to city hall. As activists pointed out, this was the first step to getting licenses for all undocumented in Florida. They plan to go back to city hall, and get their resolution passed. After that, they plan to go the state capitol with the same demands. The rally showed that different groups united for one demand: Licenses for All. People across the country and across Florida understand the benefit of licenses and how denying the undocumented licenses is a denial of equal rights. The activists are planning another action soon.